Imaging tests may include X-rays and/or a CT scan . Healing time varies by age and overall health. Children and people in better overall health heal faster. In general, it may take several weeks for a skull or facial fracture to heal. Activities will need to be adjusted, but complete rest is rarely required. Ice may also be recommended to help with discomfort and swelling. Physical therapy or rehabilitation may be needed to keep muscles strong. Concussion and mild traumatic brain injury. EBSCO DynaMed Plus website. Available at: http://www.dynamed.com/topics/dmp~AN~T116529/Concussion-and-mild-traumatic-brain-injury . Updated June 21, 2017. September 1, 2017. Facial fractures. Cleveland Clinic website. Available at: http://my.clevelandclinic.org/services/head-neck/treatments-services/facial-fractures. Updated November 12, 2015. Accessed September 1, 2017. 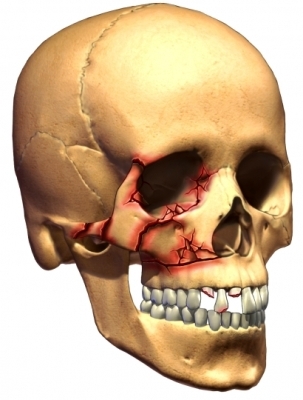 Maxillofacial injuries. Patient UK website. Available at: http://patient.info/doctor/maxillofacial-injuries. Updated December 19, 2014. Accessed September 1, 2017. Moderate to severe traumatic brain injury. EBSCO DynaMed Plus website. Available at: http://www.dynamed.com/topics/dmp~AN~T900588/Moderate-to-severe-traumatic-brain-injury . Updated April 10, 2017. Accessed September 1, 2017. NINDS traumatic brain injury information page. National Institute of Neurological Disorders and Stroke website. Available at: https://www.ninds.nih.gov/Disorders/All-Disorders/Traumatic-Brain-Injury-Information-Page. Accessed September 1, 2017. Skull fracture—emergency management. EBSCO DynaMed Plus website. Available at: http://www.dynamed.com/topics/dmp~AN~T902792/Skull-fracture-emergency-management . Accessed September 1, 2017. Subdural hematoma. EBSCO DynaMed Plus website. Available at: http://www.dynamed.com/topics/dmp~AN~T114154/Subdural-hematoma . Updated March 16, 2017. Accessed September 1, 2017. Traumatic brain injury and concussion. Centers for Disease Control and Prevention website. Available at: http://www.cdc.gov/TraumaticBrainInjury/index.html. Updated July 6, 2017. Accessed September 1, 2017.